Physiotherapy Outpatients’ Department, Southlands Hospital, Upper Shoreham Road, Shoreham By Sea. There is a growing body of evidence that has linked loss of internal rotation of the glenohumeral joint with sub-acromial pathology such as impingement, tendinopathy and labral lesions. Historically, the source of this restriction was considered to be thickening of the posterior capsule, which has been extensively described in baseball pitchers. More recently, muscular stiffness in infraspinatus and teres minor has been described as a possible source but there is little research investigating this. The aim of this study was to investigate a possible myogenic source as the soft tissue restraint to glenohumeral internal rotation, by measuring change in internal rotation range following a soft tissue intervention in the dominant arm of asymptomatic subjects. Range of movement of the dominant and non-dominant arm were measured in a position of 90 degrees abduction in a standardised way, using an inclinometer. A soft tissue intervention was then delivered to the muscle belly of infraspinatus and teres minor and measurements of internal and external rotation were repeated. The control arm displayed excellent ICC(1,1) values of reliability of 0.986, and the intervention arm demonstrated a statistically significant increase of internal rotation following intervention, mean 10.5 degrees (SD ±8.07). Internal rotation deficit of 10 degrees or more was recorded in the dominant arm in 46% of asymptomatic participants. Total rotation deficit of 10 degrees or more was present in 33% of participants. The results suggest that in some asymptomatic participants, stiffness in the muscle belly of infraspinatus and teres minor may act as a soft tissue restraint to internal rotation. The technique described is effective at inducing immediate increase in the range of internal rotation of the glenohumeral joint in some subjects. Glenohumeral internal rotation deficit (GIRD) is commonly described in the literature as a measure of posterior shoulder tightness (Myers et al 2006, Wilk et al 2011). GIRD is of interest because a deficit of internal rotation has been linked with several shoulder pathologies, including internal impingement (Tyler et al 2010, Myers et al 2006), sub-acromial impingement (Tyler et al 2000), superior labral lesions (SLAP) (Burkart et al 2003A), and rotator cuff tears (Burkart et al 2003B). Much of the literature relating to loss of internal rotation refers to contracture of the posterior capsule, specifically a thickening of the posteroinferior recess in the posterior band of the inferior glenohumeral ligament (Burkart et al 2003A). The evidence for the involvement of the posterior capsule relates almost exclusively to populations of professional throwing athletes and consists of surgical observations (Burkhart et al 2003A, Ticker et al 2000) and cadaveric studies where surgical tightening of the posterior capsule has resulted in a reduction of glenohumeral internal rotation and horizontal adduction (Harryman et al 1992, Werner et al 2004). To determine the effect of soft tissue intervention to infraspinatus and teres minor on the range of shoulder internal rotation. 3. Total Rotation Motion (TRM) deficit. To assess the reliability of a method of measuring shoulder rotation. On arrival at the Human Movement Laboratory at the University of Brighton participants were asked to read the participant information sheet and sign the consent and eligibility form. They were then asked to lie supine on the plinth and the measurement brace was attached to their arm (Fig1) and an inclinometer was attached in order to record the range of rotation (Fig 2). In order to apply a standardised force of overpressure to the movements of internal and external rotation, a suspension scales was attached at the wrist joint and the range of internal and external rotation was measured for both shoulders. An overpressure force of 1kg was applied at end range using the suspension scales; this force was applied at approximately 90 degrees to the forearm (Fig3). During the measurement of internal rotation a research assistant applied firm pain free pressure through the coracoid to prevent protraction of the shoulder girdle, whilst being careful not to apply compression over the head of the humerus (Fig3). The soft tissue intervention was then delivered to the posterior aspect of the right shoulder in all cases and the measurements were repeated in exactly the same way. A total of 24 asymptomatic participants (48 asymptomatic limbs) took part in the study. All participants were in good health, 18-65 years of age, and had not suffered from shoulder or neck pain in the preceding two weeks. 8. Diagnosed history of neurological condition or previous shoulder/neck surgery. 11. Inability to lie prone comfortably to have soft tissue treatment carried out. The subject group comprised asymptomatic volunteers from local swimming clubs, cricket clubs and hockey clubs as well as pre-registration and postgraduate physiotherapy students recruited from the School of Health Care Professions at the University of Brighton. Intervention consisted of a 10-minute treatment dose of soft tissue therapy applied to the muscle bellies of infraspinatus and teres minor. The treatment was targeted directly to the regions of the muscle belly considered stiff to palpation. The area treated was bordered by the bony landmarks of the spine of the scapula superiorly and the medial and lateral borders of the scapula. A slow oscillatory force was applied at the same site for 10 seconds with 2 seconds of release; this was repeated for 1 minute before moving on to a separate point in the muscle considered stiff to palpation. Pressure was applied until mild to moderate resistance was felt in the tissue and feedback from the patient was obtained at each site of application within the muscle belly to ensure the technique was not painful. A retrospective sample size calculation was performed using minitab power calculation for related T-test. This calculation was performed based on the mean difference of intervention of 10.5 degrees, SD of 8.07 degrees and the sample size of 24. The results show the data were sufficiently powered at 0.999. Internal rotation in the intervention arm was normally distributed (Shapiro-Wilk test significance; p=0.968 pre intervention, p=0.384 post intervention and p=0.979 difference between pre and post-intervention values) and met the criteria for parametric testing. A related t-test was used to calculate statistical significance for change in internal rotation following intervention. The mean range of internal rotation in the dominant arm increased from a mean of 48.6 degrees to 59.1 degrees following intervention, a mean increase of 10.5 degrees. The range of internal rotation in the non-dominant arm changed from 56 degrees to 55.3 degrees from pre-to post intervention (Table 1). The individual response of participant’s internal rotation to soft tissue intervention is graphically represented in figure 1. Using a related t-test on the data (t=6.374, N=24), the results are significant at p< 0.005 for a two-tailed test. The experimental hypothesis has been supported, suggesting that the soft tissue intervention resulted in a statistically significant increase in glenohumeral internal rotation in 90 degrees abduction. Results show that GIRD frequently occurs in asymptomatic participants and is more common in the dominant arm, but does occur in the non-dominant arm. 11 participants (46%) demonstrated GIRD of 10 degrees or more in their dominant arm. 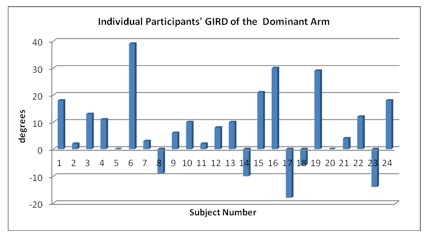 3 (13%) participants demonstrated GIRD of 10 degrees or more in their non-dominant arm (see figure 2). The results show excellent values for reliability for internal rotation and external rotation in the control arm and external rotation in the intervention arm. The measures of reliability for internal rotation of the control arm are ICC (1,1) 0.986, with a mean difference of 1.67 degrees (SD ±1.99). The results of this study demonstrate that a single treatment of soft tissue mobilisation to the muscle belly of infraspinatus and teres minor resulted in a statistically significant increase in glenohumeral joint internal rotation. Internal rotation increased following intervention from a mean value of 48.6 degrees to 59.1 degrees, which is a mean increase of 10.5 degrees. But what is considered a clinically significant change in shoulder range? Croxford et al (1998) suggests that clinicians using goniometry should only consider a real clinical change has occurred when there has been an increase in range of more than 5 degrees. Tyler et al (2000) reported a mean deficit of internal rotation of 9 degrees compared to the asymptomatic group in a population of participants with subacromial impingement. Warner et al (1990) have described internal rotation deficits in non-throwing patients with subacromial impingement of 20 degrees, and Myers et al (2006) described a 19.6 degree average GIRD in a population of throwing athletes with internal impingement. Based on this research, it was considered reasonable to assume that a 10 degree increase in internal rotation following this single intervention would be deemed clinically significant. 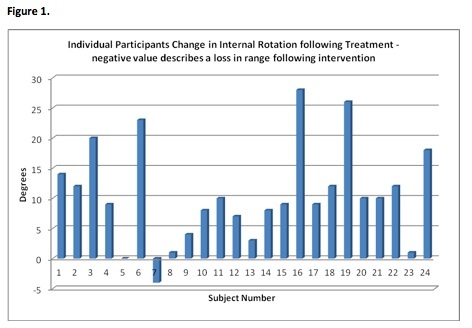 Of the 24 participants, 12 increased their internal rotation by 10 degrees or more following intervention. Therefore, based on this assumption, 50% of participants had a clinically significant increase in internal rotation following intervention. Why did some of the participants not demonstrate an increase in internal rotation? It is possible that in some participants, prior to intervention, internal rotation was restricted by capsular tissues and in some participants this restraint was due to stiffness of the muscle belly of infraspinatus and teres minor. If the restraint to internal rotation is related to articular structures, it might be reasonable to assume that an intervention to the muscle belly would be unlikely to influence range. Conversely, if the restraint prior to testing was due to stiffness of the muscle belly of infraspinatus and teres minor, an increase in range following treatment of this restraint would be more likely to yield increased range. The mean range of dominant internal rotation for this study (48.6 degrees) was similar to that described by Tyler et al (2000) (47.7 degrees), but far less that described by Torres and Gomes (2009) (70.5 degrees). The variance was much greater in the current study, with a SD of 15.8 degrees for dominant internal rotation compared with 1.5 degrees from Tyler et al (2000) and 7.8 degrees from Torres and Gomes (2009). It is difficult to explain this discrepancy, as Tyler et al (2000) did not publish any demographic data relating to their control group and Torres and Gomes (2009) only published data relating to the mean age (41 ±8.4 years) of their control group, which was comparable to the mean age in this study of 40 (SD 11.8) years. The incidence of GIRD in this study was defined as a 10 degree deficit of internal rotation in the dominant arm, and was identified in 11 participants (46%). 4 (17%) participants demonstrated a deficit of more than 20 degrees. 3 (13%) participants demonstrated GIRD of 10 degrees or more in their non-dominant arm. The results suggest that GIRD does occur in asymptomatic participants. ICC provides a numeric means of assessing the agreement between two sets of data, thus providing an indication of the repeatability. Hicks (2004) provide guidelines for the interpretation of results, suggesting IC values above 0.75 are indicative of good reliability. The results of this study suggest excellent levels of reliability for internal and external rotation on the left (ICC = 0.986 and ICC = 0.992, respectively) and external rotation on the right (ICC = 0.992). The only reliability measure obtained was intrarater, intrasession reliability. Previous research has demonstrated that this often yields the highest reliability measures and reliability reduces with long time intervals between tests (Gajdosik and Bohannon 1987) and with the inclusion of different examiners (interrater) (Eliasziw et al 1994). One significant factor that may have affected primary outcome was the lack of blinding of the examiner to the measurements of rotation. That is, the same examiner delivering the intervention was involved in the measurement of rotations pre and post intervention. This could result in bias of the retest measurement of rotation, thus artificially increasing response to treatment. There was a statistically significant increase in internal rotation of the intervention arm following the soft tissue intervention (mean 10.5 degrees). 50% of subjects increased their internal rotation by 10 degrees or more; it is possible that in these subjects the restraint to internal rotation was as a result of stiffness in the muscle belly of infraspinatus and teres minor. In 25% of subjects the change in range was 4 degrees or less; it is possible in these subjects that the restraint to internal rotation came from another source, such as the posterior cuff-capsule complex. The intervention - consisting of 10 minutes of slow sustained oscillations (10 seconds on and 2 seconds off) to the areas of the muscle belly deemed stiff on palpation - appears to be an effective intervention at increasing range of movement of shoulder internal rotation in some subjects. The method of assessing rotational range of movement in 90 degrees abduction has demonstrated excellent levels of intrarater intrasession reliability. Completed as part of the University of Brighton MSc programme. Kevin prides himself on providing clients with treatment based on the best scientific evidence. To ensure his ability to do this, Kevin has continued to study at the highest level; his qualifications include an MSc in Manipulative Neuromusculoskeletal Physiotherapy and BSc (Hons) Physiotherapy and he has recently been awarded a clinical research internship at the University of Brighton. He is currently in the process of applying for a National Institute of Health (NIHR) Doctoral Fellowship to conduct PhD research into shoulder impingement. Kevin is a clinical educator for students on the MSc programmes at the University of Brighton and University of Hertfordshire and writes and delivers postgraduate training courses. He is also a member of the exclusive MACP. As well as running the clinic in Brighton and Hove, Kevin is also a Clinical Specialist Physiotherapist (ESP) working part time in the NHS at Worthing and Southlands. Kevin has previously been physiotherapist to Haywards Heath Rugby Club 2004-2005 (national league) and Brighton Rugby Club 2003-2004, and has developed special links with many local sports clubs and coaches. This evaluation of a soft tissue intervention prepared as part of a MSc in physiotherapy investigates the role of muscular tightness of the external rotators of the glenohumeral joint in glenohumeral internal rotation deficit, GIRD. The paper provides a referenced outline of how the contribution of muscular tightness in GIRD sits with pervious descriptions of capsular tightness as it’s main causative factor. The methodology is well described although the validity and reliability of the measurement process are not provided in detail. A description of the soft tissue intervention used is given but no justification is provided for the choice of this intervention. The results show a statistically significant increases in internal rotation following the soft tissue intervention, supporting the role of muscular tightness in GIRD. In this paper the soft tissue intervention was applied to healthy subjects. Since the relevance of the research is supported by the causative nature of GIRD in shoulder pathologies such as internal impingment, subacromial impingement, labral lesions and rotator cuff tears, it would be interesting to investigate the effects of the intervention on symptomatic subjects to support it’s value as a treatment. The paper looks at the immediate effects of the intervention. It would be interesting to see the lasting effects and the effects of repeated interventions on a timescale realistic for outpatient physiotherapy services. The presented numerical results show a wide variance in response to the treatment from a 4 degree reduction in internal rotation to a 27 degree increase. It would be interesting to know if it is possible to distinguish between those individuals who respond well to the treatment and those who do not. An eyeball comparison of the graphs provided of increase in ROM and pre-existing GIRD appears to show that those who had the most significant GIRD saw the greatest increase in ROM. Statistical analysis of this may prove interesting and help target appropriate interventions to the right patient groups. The soft tissue intervention in this study comprised of oscillatory input to the muscle belly. It would be interesting how the results of other soft tissue interventions such as trigger point release, stretching, muscle energy techniques and myofascial release compare. An interesting look into the role of muscular tightness as a contributory factor in GIRD that raises further questions about the role of physiotherapy techniques in the prevention and treatment of shoulder injuries. Maybe a few more MSc projects to come.